Leo VI, called the Wise or the Philosopher (Greek: Λέων ΣΤ΄ ὁ Σοφός, Leōn VI ho Sophos, 19 September 866 – 11 May 912), was Byzantine Emperor from 886 to 912. The second ruler of the Macedonian dynasty (although his parentage is unclear), he was very well-read, leading to his surname. 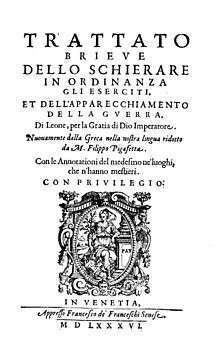 During his reign, the renaissance of letters, begun by his predecessor Basil I, continued; but the Empire also saw several military defeats in the Balkans against Bulgaria and against the Arabs in Sicily and the Aegean. Leo VI (right) and Basil I, from the 11th-century manuscript by John Skylitzes. Born to the empress Eudokia Ingerina, Leo was either the illegitimate son of Emperor Michael III or the second son of his successor, Basil I the Macedonian. Eudokia was both Michael III's mistress and Basil’s wife. In 867, Michael was assassinated by Basil, who succeeded him as Emperor. As the second eldest son of the Emperor, Leo was associated on the throne in 870 and became the direct heir on the death of his older half-brother Constantine in 879. However, Leo and Basil did not like each other; a relationship that only deteriorated after Eudokia's death, when Leo, unhappy with his marriage to Theophano Martiniake, took up a mistress in the person of Zoe Zaoutzaina. Basil married Zoe off to an insignificant official, and later almost had Leo blinded when he was accused of conspiring against him. On August 29, 886, Basil died in a hunting accident, though he claimed on his deathbed that there was an assassination attempt in which Leo was possibly involved. Leo also attempted to control the church through his appointments to the patriarchate. He dismissed the Patriarch Photios, who had been his tutor, and replaced him with his own 19-year-old brother Stephen in December 886. On Stephen's death in 893, Leo replaced him with Zaoutzes' nominee, Antony II Kauleas, who died in 901. Leo then promoted his own Imperial secretary (mystikos) Nicholas, but suspicions that he was involved in the failed assassination attempt against Leo in 903 as well as his opposition to Leo’s fourth marriage saw Nicholas replaced with Leo’s spiritual father Euthymios in 907. Gold solidus of Leo VI and Constantine VII Porphyrogennetos, 908–912. ↑ Reuter, Timothy, The New Cambridge Medieval History, Vol. III: c. 900-c. 1024, Cambridge University Press, (2000), pg. 334.